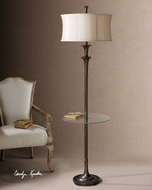 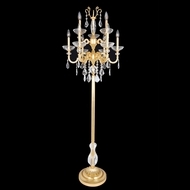 Traditional Floor Lamps are a great way to add just the right nuance to any room or office. 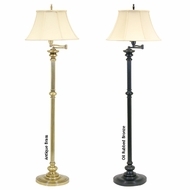 These handsome lamps are characterized by their stately upright profile, the seasoned design of their body and shade, and their overall refined finish. 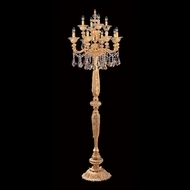 For a complete look, consider complimenting your selection with Traditional Table Lamps, Traditional Ceiling Lighting, Traditional Chandeliers, Traditional Pendant Lighting or Traditional Wall Sconces. Even if your environment has a more modern flare, a Traditional Floor Lamp can add a bold element of contrast to the picture. 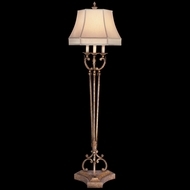 Try placing one in your clubhouse or game room to give it an unexpected layer of personality. 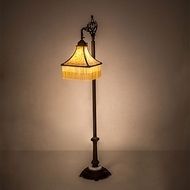 The beauty of these affordable lamps is their versatility; they�re perfectly at home wherever an extra touch of class or source of light is needed.